NVIDIA and Intel are moving aggressively into self-driving cars, but NVIDIA’s growth opportunities extend well beyond this coming growth market. 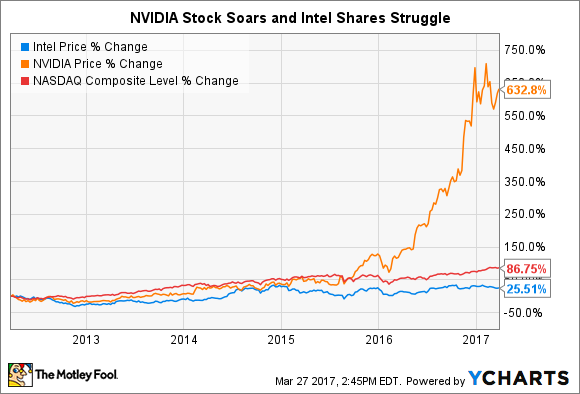 There may not be a better example of the changing of the guard taking place in tech than what's happening with Intel (NASDAQ:INTC) and NVIDIA (NASDAQ:NVDA). The old guard -- Intel -- remains the largest and most profitable semiconductor company in the world, though Qualcomm has vied for that crown once or twice in the past decade. NVIDIA is the ascendant challenger, though by no means a new company itself. And though NVIDIA's $63 billion market cap remains much smaller than Intel's $167 billion valuation, their more recent trading histories speak volumes about the trajectories of each business. Importantly, Intel's planned $15.3 billion buyout of self-driving-car chip designer Mobileye (NASDAQOTH:MBBYF) changes the outlook for the stodgy chipmaker to a meaningful degree. Even taking that into account, though, NVIDIA still remains a better stock than Intel to own today for long-term tech investors. Thanks to its multiple significant growth drivers, NVIDIA appears poised to grow at above-average rates for many years to come. Though its gaming segment contributes the majority of its revenue, NVIDIA's true growth drivers lie in two segments: data center and auto. Its data center platform houses NVIDIA's artificial intelligence (AI) computing chips, which have emerged as the go-to standard among many of the world's foremost developers of AI software -- Alphabet, Baidu, Facebook, and more. Revenue from the data center segment more than doubled last year, and the market is in many regards just taking shape. By 2020, researcher IDC estimates that AI software will have surged to reach $47 billion in sales, and NVIDIA seems like a fairly safe bet to power the majority of this software. In its automotive segment, the company continues to press forward at an impressive clip. Revenue in the segment increased by 52% last year, which, again, low-balls its eventual growth potential. The company has partnered with many of the foremost pioneers in the space -- including Tesla, Baidu, Honda, BMW, and many more -- which should help pave the way for revenue growth to accelerate as autonomous vehicles become increasingly popular in the 2020s. Moreover, NVIDIA continues to improve on its current technologies and forge new partnerships, which should help the chipmaker maximize its market share and profits in future years. In the past several weeks, NVIDIA announced partnerships with Bosch and PACCAR, each of which touch on previously unexploited areas of the automotive industry for NVIDIA. As such, its multiple mass-market growth drivers make NVIDIA a better long-term growth stock than Intel, despite savvy recent maneuvers from the world's largest chipmaker. Up recently, the future seemed increasingly bleak for Intel. The chipmaker derives 55% of its business from chips that power personal computers, a segment that remains in secular decline. For example, IDC expects PC shipments to decline at an average annual rate of 0.8% through 2020. Growth from the company's data center business -- Intel's second-largest segment -- has not been enough to offset the declining fundamentals of Intel's PC business. Gross and operating margins have fallen in each of the past two years. Intel was largely stuck in neutral, even as the technology landscape around it continued to change -- that is, until it announced its Mobileye deal in mid-March. By buying one of the leading component designers for autonomous vehicles -- and paying one heck of a handsome price for it in the process -- Intel showed both its desperation and determination to not miss another transformative technology trend, as it did in smartphones and tablets. In that regard, Intel has acquired an autonomous-vehicle component producer that really only NVIDIA can rival. Mobileye's advanced driver assistance systems are found in over 15 million vehicles worldwide. The company currently has deals with all major tier-1 automotive suppliers and 27 major automakers. Better still, integrating Mobileye into Intel's processor ecosystem will allow the chip giant to combine in-car computing technology with data center and cloud computing processing that should create an end-to-end autonomous-vehicle computing platform. It's an impressive value proposition that Intel CEO Brian Krzanich argued will make Intel one of the leading players -- alongside NVIDIA -- in what could eventually become a $70 billion total addressable market by 2030. As impressive as this is, though, particularly considering Intel's outlook before the Mobileye deal, it remains important to note that NVIDIA still enjoys an advantage, given its significant exposure to AI computing and self-driving cars. Because of this twofold upside, NVIDIA remains the better semiconductor stock for long-term growth investors to own today.